Today is the 72nd anniversary of my parents’ wedding. 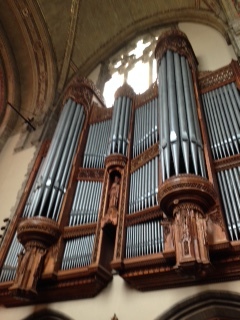 I would like to commemorate it by telling about a lovely trip I recently took to Rockefeller Memorial Chapel at the University of Chicago where my dear college friend, Phil, is organist. He and I were so excited to find out that where he works is also where my parents were married on June 19, 1943. 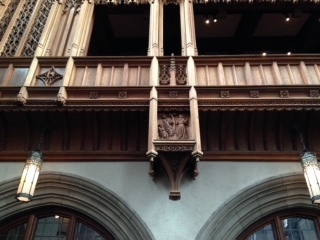 You can read more about my recent adventures at the Chapel here. Now for some photos from the 1940s! 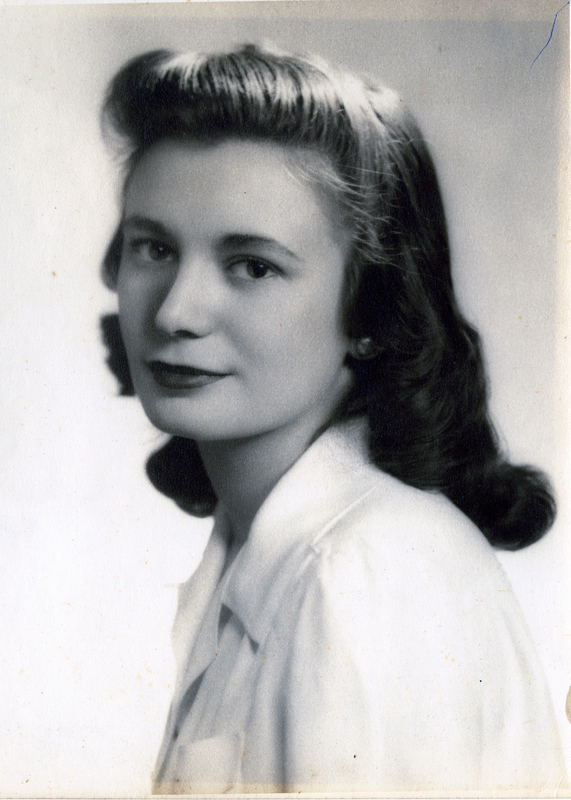 Joan’s engagement photo dates from early 1943. Here are treasured photos from my parents’ wedding on June 19, 1943. 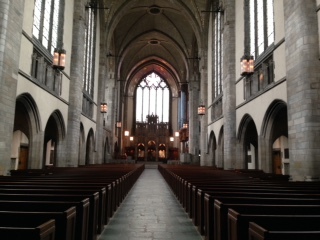 Bob Morrison and Joan Wehlen get married at Rockefeller Chapel! Werner Wehlen and Neva Wehlen (nee Levish). Mom and Dad cutting the cake–and this during wartime rations! Now it is 72 years since that auspicious day. Joan and Bob were married 66 years and died within 2 months of each other. We miss them profoundly, but we grateful for having had them as wonderful parents! Happy Anniversary! 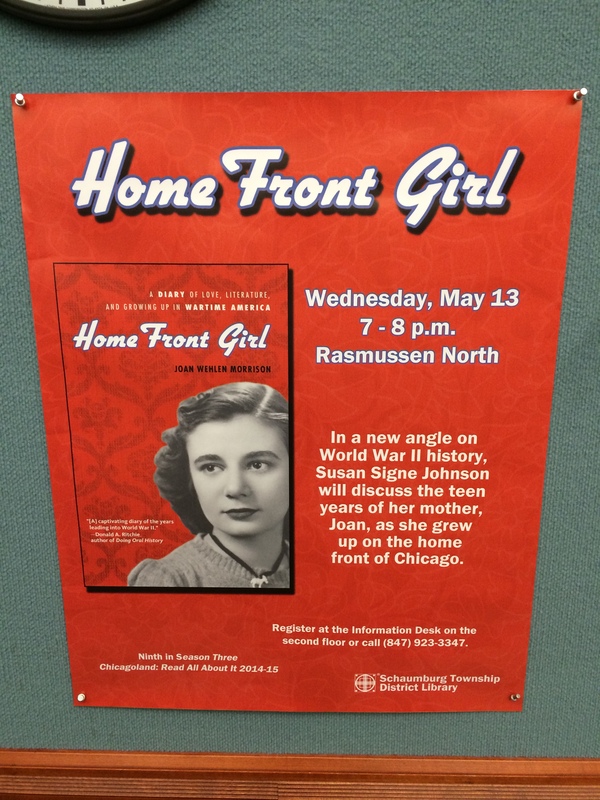 I was invited to give a talk about my mom, Joan, and her diary Home Front Girl at the Schaumburg Township District Library in Illinois, part of the greater Chicago area. Joan grew up in Chicago, so I was thrilled to be able to share her story with natives of the area. Beautiful poster–though my name is “Morrison,” not “Johnson”!!! The trip consisted of more than giving a talk. 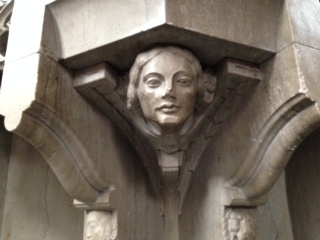 As I was staying with a dear college friend, Phil, we undertook an exciting and unexpected treasure hunt to find out where my mom, Joan, lived in the 1930s and 1940s. 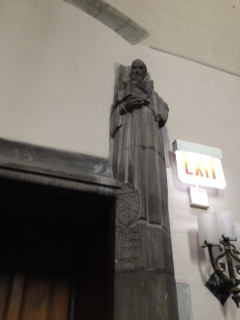 Phil and I were thrilled to find out that his job as an organist at Rockefeller Memorial Chapel on the University of Chicago campus which Joan attended had personal resonance. Joan and my dad, Bob, were married there in 1943!! 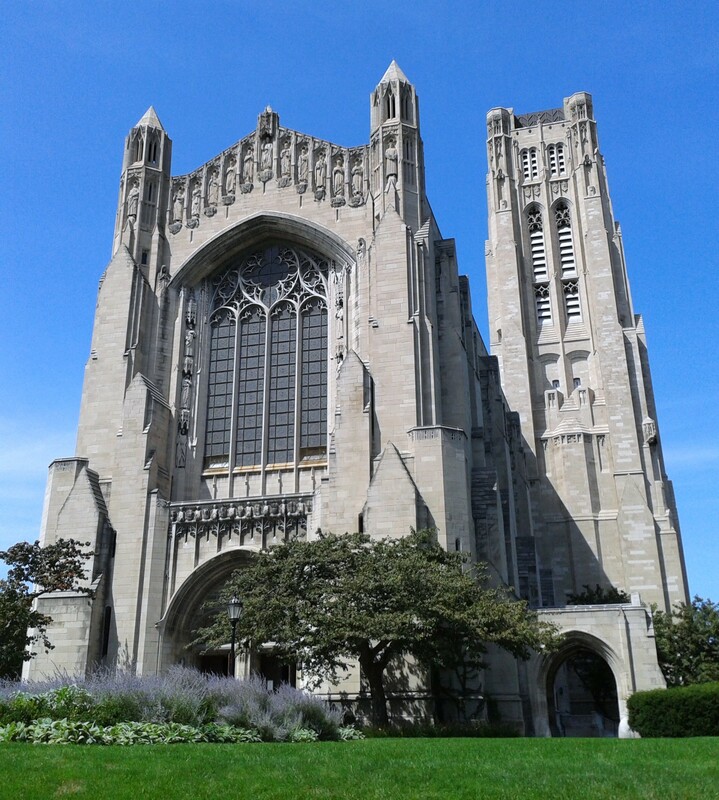 Rockefeller Memorial Chapel in lovely weather. 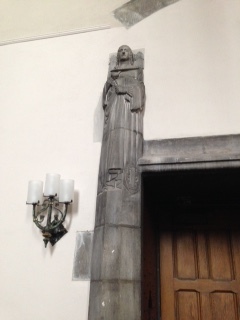 Joan was certainly aware of the namesake of the Chapel. When she was 14 years old, she wrote a poem in response to the death of Rockerfeller (that’s how she spelt it!). Than put myself into your place. 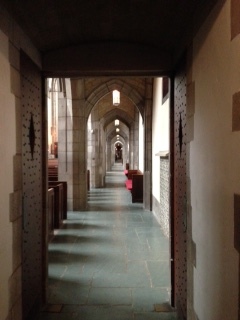 I took many photos in the Chapel while Phil brilliantly taught his super talented musican students. 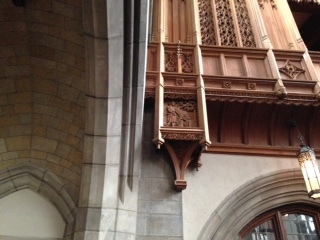 I took a video inside the chapel. 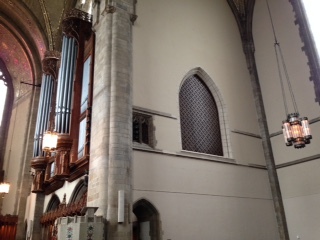 Here is some lovely music played by my friend’s student as I wandered and wondered in the Chapel in 2015. 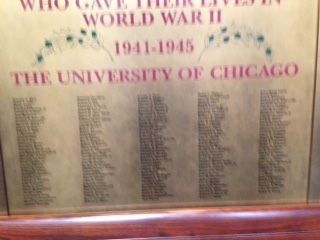 Joan writes about hearing the President of the University of Chicago speak well after the war has begun in Europe, but before Pearl Harbor. She is 18 years old when President Hutchins talks from the Chapel. Here is a copy of Hutchins’ speech that Joan heard: http://www.ibiblio.org/pha/policy/1941/1941-03-30a.html. Little did she know when she wrote those words that in less than two years she would be married to my dad there! I’ll be posting photos from that event in a few weeks. 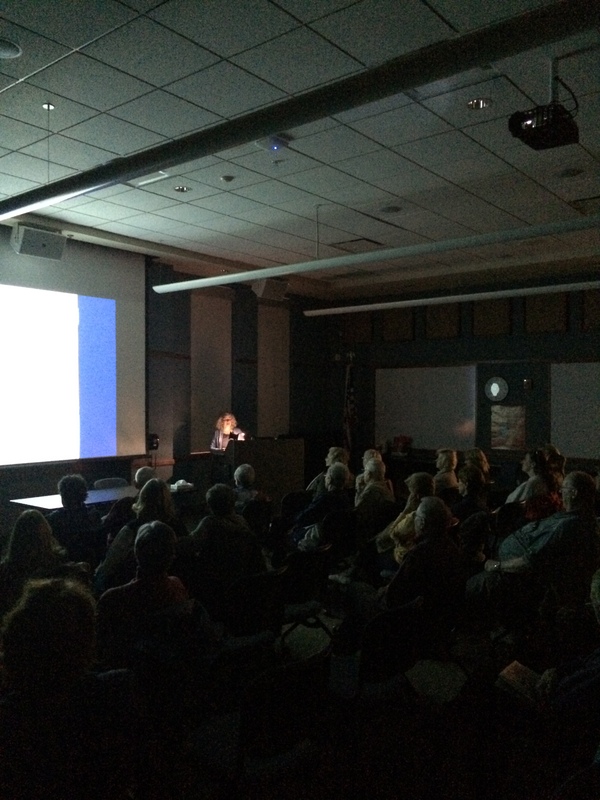 Here are more photos from my talk in Schaumburg. My dear friend, Phil, took the photos at the event in Schaumburg, Ill. 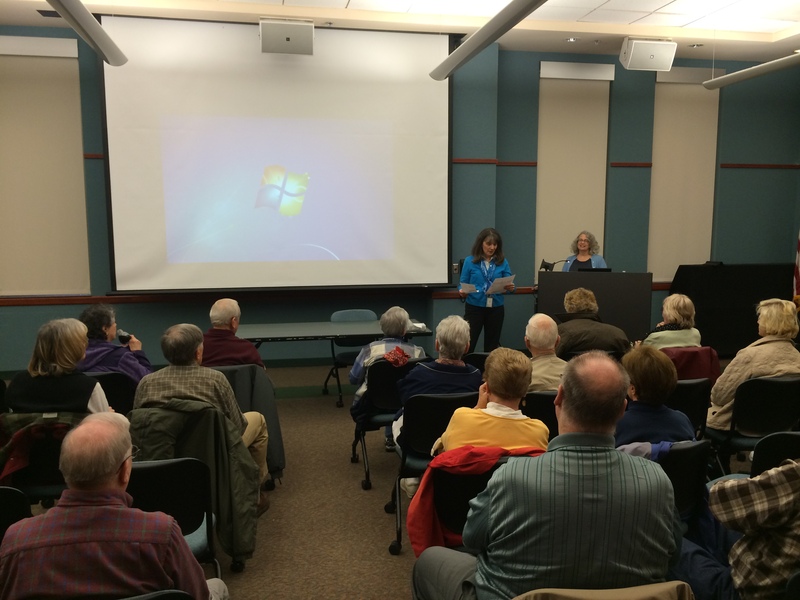 Here I am being introduced by the librarian who invited me, Jane Rozek. The mysterious ways of time passing and people connecting in unexpected ways….. Giving my talk in Schaumburg. An eerie light is cast.